This week’s CometWatch entry was taken with Rosetta’s NAVCAM on 22 August 2016, when the spacecraft was 6.8 km from the centre of Comet 67P/Churyumov-Gerasimenko. The average distance to the surface is about 5.6 km, and with an image scale of 0.5 m/pixel, the image measures about 500 m across. 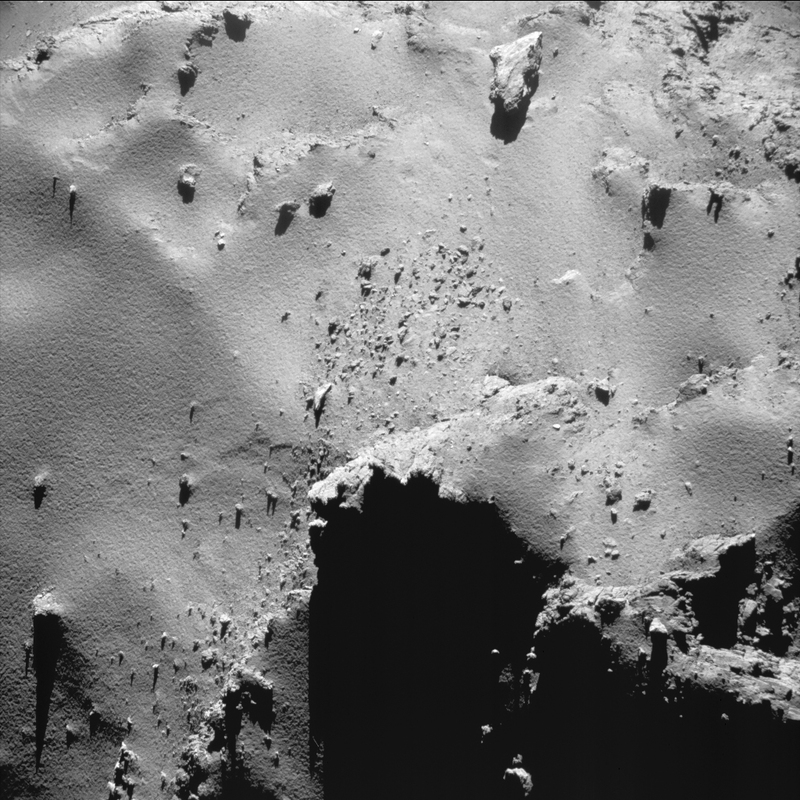 Enhanced NAVCAM image of Comet 67P/C-G taken on 22 August 2016, 6.8 km from the nucleus. The scale at the surface is about 0.5 m/pixel and the image measures about 500 m across. Credits: ESA/Rosetta/NAVCAM – CC BY-SA IGO 3.0. The image shows part of the Ma’at region, close to where it transitions into Anuket and Hathor regions on the comet’s small lobe. It shows a beautiful contrast between smooth, dust covered surfaces, and rather angular outcropping terrain and scattered debris. For more close-up images taken in the last week, be sure to check the OSIRIS image of the day website. The only realistic possibility is to end ESA’s commission with Rosetta in a hibernated state. In 2020 wake up and use what little fuel is left next perihelion to regain contact, including with Philae. The progressive patterning on the texture of the returned coma’s dust remembers of a coarse textile. Dominant axis here are 60º and 120º.